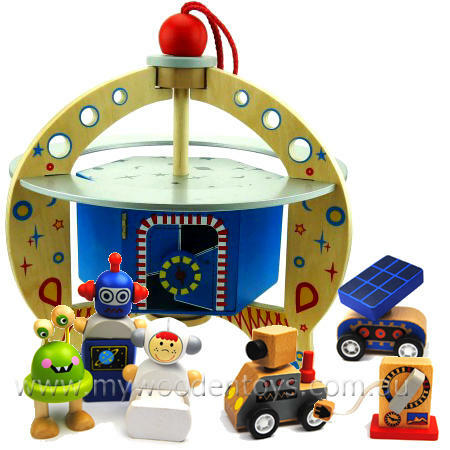 Wooden Spaceship Alien Playset is an out of this world toy with a wonderful rotating UFO, robot and spaceman figures, two lunar vehicles, a re-fueling pod and a crazy green alien. The spaceship is very cleverly designed and needs to be assembled with the clear instructions provided. The Spaceship has a blue rotating section with a door which opens so all the sets pieces can be stored inside and carried / flown around using the strong loop at the top. The robot and alien are able to sit, stand and swap tops and bottoms by simply twisting them. The two little cars are free wheeling and all ready to zip about the alien planets surface and be refueled at the refueling pod. Finally a little alien with eyes on stalks is all ready to take you to his leader. Size: Alien ship is 30cm high x 30cm wide x 30cm long. Characters are 90cm high. We like this because: "A fantastic toy to fire the imagination."